After a year of "issues" I finally have a working IBM PS/2 Model 30-286! It's a cute little number and I'm pleased to have it. However, of all the units I own, this one has given me the most grief and has cost me far more than it's actually worth. IBM's PS/2 line was a late 1980s attempt by Big Blue to wrestle back oodles of market share being lost to the PC clone makers. The idea was to make a line of proprietary machines that couldn't be cloned and that everyone would want. IBM would licence the technology to anyone who wanted to support it, creaming off fat royalties on the way. The technology was called Microchannel Architecture (MCA) and it was indeed superior to the then-current ISA Bus. To IBM's surprise, people were quite happy with the less-expensive and open ISA standard so the strategy didn't work. 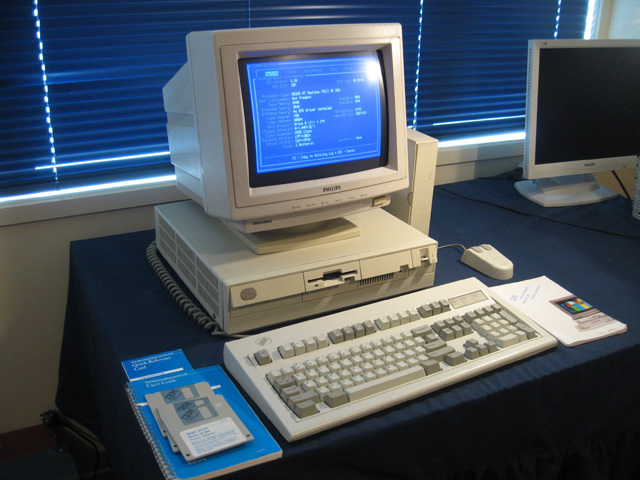 Nevertheless, the PS/2 machines did set conventions that appeared in later PCs namely the PS/2 mouse and keyboard ports, VGA graphics, 72-Pin Simm DRAM and the 1.44 MB 3.5 inch floppy drive. For all those reasons I deemed these early PS/2 models "notable" and wanted one for my collection. Our auction site Trade Me has a vintage computer section. It's rare to see old business computers appear there, but they do show up occasionally. About a year ago, a PS/2 Model 30-286 console had been continuously relisted there over a period of about 2 months. At $NZ65 ($US40) reserve it was overpriced, which is why no one bidded. Finally though, it wore me down. After seeing its cool-looking case winking at me every time I opened my browser window, I finally took the bait and bought it. On examination after arrival, the machine seemed in reasonably good nick. Popping the case revealed a motherboard the likes of which I'd never seen before in a vintage PC. First of all there was just a single large slot, right in the middle of the board. This in itself was weird. How could people add cards? Even weirder was the on/off switch arrangement. 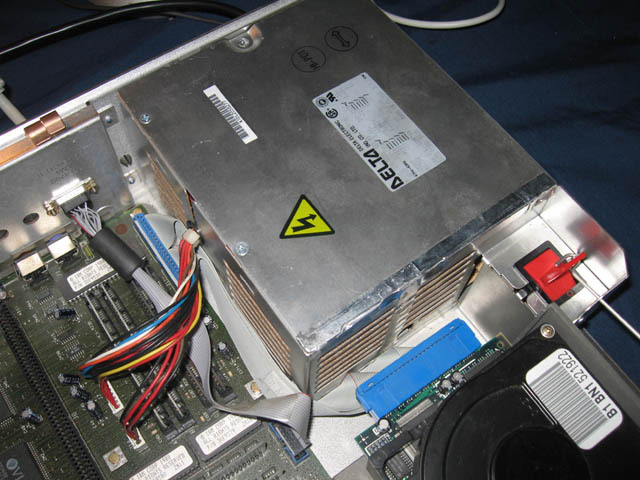 The switch on the case was connected to a lever, which wrapped around another switch on the power supply (PSU) (see photo 3). Strange? Why not just directly wire it in? There were lots of VLSI (Very large scale integration) ICs on the board, something I hadn't seen a lot of with the old iron I was used to playing with. The PS/2 worked, but there was an issue. The power supply switch seem to have a faulty internal connection. You had to switch it on, then move it back a fraction before the PSU would fire. This worked most of the time initially but after a while the switch became very sensitive. Move it just a fraction and the machine would power down. Powering up often took several attempts and you had to maneuver the switch so it was just in the right position. Sporadic bursts of electricity are not good for any components of course. I was worried about damage. Eventually however, the machine forced my hand. The PSU switch gave up the ghost entirely! I probed around a bit seeing if a fix was feasible but the whole assembly was welded shut. In the end I decided I needed to get another PSU. In New Zealand IBM PS/2 Model 30-286 power supply units don't just sit around waiting to be sold. Neither do PS/2s generally. As luck would have it though, a few months after the PS/2 stopped working another one appeared on Trade Me. What's more it was the same model. A rare coincidence indeed! This was the whole computer, screen, keyboard and everything. Problem was it was a long long way from where I lived and the buyer was not interested in shipping. The screen and the keyboard were not that important to me but I did want the box. Luckily for me there was a bidder in the same town as the buyer, and this guy wanted only the keyboard. In the end, we struck a deal. I would bid and if we won, we would split the cost 50:50. He would take the keyboard and screen, and ship the box and associated items (mouse, key, manuals) down to me. In the end, I got my replacement unit for a mere $13.50 plus shipping. This unit was fine with no switching issues. 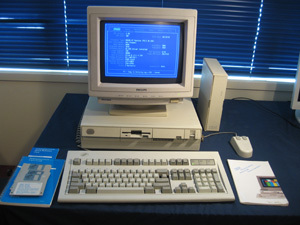 It was a later variant with a slightly different planar and a larger hard drive loaded with DR-DOS and Windows. It also showed what that large central slot was for. 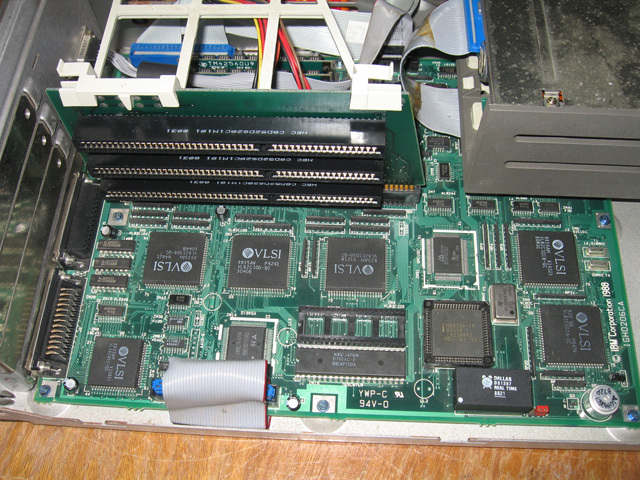 A riser board, which contained several ISA slots nestled comfortably there. By this time I'd discovered that the Model 30-286 was one of the few PS/2s that did not have the MCA architecture, but rather the more conventional ISA bus. Oh well...disappointing but it still had those other PS/2 innovations, so it still had historical value to me. Plugging it back into revealed a lonely RAM error with a POST note of 000000 0000 201. Oh no! The RAM chips tested out ok though. Something had been zapped on the motherboard and the machine would not progress past this error note. No worries, a composite machine, yes? Well, never mind. I did have the planar from the original machine. I would just swap that in and have a composite machine from the two I owned. Well, that was the theory. To my dismay I found that that first planar also had issues. It just wouldn't fire most of the time. On rare occasions, it would...but life would be short and fleeting. Ten minutes at the most and it would be dead again! I figured all the power surges from the dodgy switch probably stressed something that was now failing. I now had two non-working boards, both with different issues. Unfortunately these boards were not identical. Apart from the CPU, none of the socketed ICs were the same. I had no circuit diagrams showing me what should connect to what and besides, much of the componentry was VLSI or surface mount. A repair to either board seemed hopeless! I did have a go. I spent many days tinkering, substituting ICs that could be substituted (like the CPU...I even bought a special extractor for the task! ), trying things, or simply staring at the board willing it to work. I suspected a particular IC may have be associated with the RAM problem in the second board, so I clipped it out and replaced it with the de-soldered equivalent from the first planar. No change. In the end I had to admit defeat. 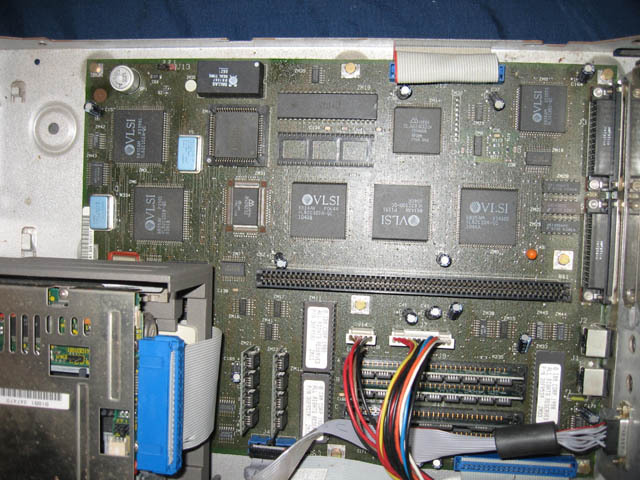 I still wanted a working PS/2 30-286 though and already had most of the parts. Where could I get another planar? Shipping a whole machine from overseas was out of the question. I'd already spent enough money on this thing. Soon after I'd given up on the repairs though, I was browsing e-bay and I saw two PS/2 30-286 planars for sale from a recycling firm. The two boards matched the two I had. At $53US plus shipping though, these were very expensive and way beyond what I could hope to recover if I ever sold the computer. Was it worth it? In economic terms, definitely not, but in emotional terms yes. I felt a bit like someone trapped in a Nigerian scam. Having invested time and money already with nothing to show for it, I felt drawn to shell out yet more money for a chance at a resolution? 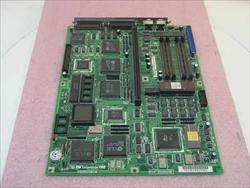 The buyer said the boards were tested, and the couple of non-working PS/2s I had were no use to me. I bit the bullet, took the gamble and ordered the later variant issue of the two boards for sale (see photo). The planar arrived last weekend. It works just fine. Now at least, I have a working IBM PS/2 30-286 albeit WAY over budget. I've reformatted the 20MB drive (I figured a 20MB drive may be closest to the original configuration) and thrown on a copy of PC-DOS 3.3 plus some utilities and games. I've used the floppy disk and PSU from the second unit but the top cover from the first one, as it was cleaner. So it truly is a composite machine, having bits and pieces from three separate units. If it ain't broke don't fix it! I won't be washing working circuit boards in the dishwasher again unless there is nothing to lose by doing so (in other words, only if they don't work anyway). Do your homework before buying a machine. I thought this PS/2 was MCA technology. It wasn't. For collections, the whole machine is best. I now wish I'd also driven up to collect that IBM screen in that second purchase. My partner in that deal really only wanted the keyboard and I suspect he threw the screen away! All that being said, I'm glad I've got this computer. They are interesting little beasts, are rare in New Zealand (I don't expect to see another one on the Trade Me site again for a while) and represent a tasty slice of computer history.